Digital, media and technology are no longer separate but are intrinsic to one another. At YouGov our researcher’s skills and knowledge reflect this dynamic sector with long-standing relationships spanning over 10 years with a range of clients. Through our research it is clear that digital innovation has led to the worlds of digital, media, and technology becoming increasingly homogeneous. Technology is changing the way media is created and consumed and media companies are adapting how they reach their audiences in a world shaped by devices and mobility. Our researchers are specialists in their field at building strong client relationships and providing the best value and insights across the market. The likes of broadcasters, manufacturers, content creators, publishers, mobile operators, and retailers are only a subset of clients that we have long standing relationships with, some spanning over 10 years. You&apos;re in good company. Join the top organisations that use YouGov solutions. 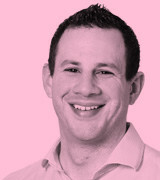 Russell Feldman has worked in digital, media and technology at YouGov for the last 11 years and heads up our 15-strong team. Russell has extensive experience and knowledge focusing on consumer trends and demand, brand tracking, customer satisfaction, churn and loyalty and new product development. "We pride ourselves on providing the best research available on the newest trends in the market. My team never stands still and are constantly researching new and exciting pieces of tech, and their impact on the world around us."